Painted Lady Fingers: Skin MD Natural 4th of July Giveaway: Win 10 bottles of Skin MD! Skin MD Natural 4th of July Giveaway: Win 10 bottles of Skin MD! I received notification of this wonderful giveaway from Skin MD Natural and wanted to share the information with you. Summer is a great time for entertaining friends and families outside around the grill! Whether it's in your backyard, at the park or on the beach, 4th of July usually means fun in the sun, a great BBQ and fireworks. 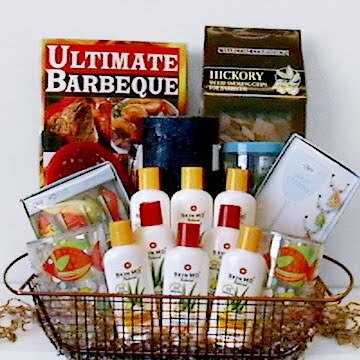 This year let Skin MD Natural help you throw the perfect bash with our Backyard BBQ Giveaway valued at over $300 Also check out our summer grill menu and summer sun safety tips to make your party a success. given at sign up for the skin care & beauty newsletter. Click here to enter the giveaway. Check out my reviews of Skin MD Natural Shielding Lotion and Shielding Lotion + SPF 15. Happy painting, ladies! Best of luck too! Thanks for posting that. I went right there and entered. I also ordered the orginal lotion 2 weeks ago. Hoping it will help the skin on my shins. Thank you for this amazing giveaway. I took the time to enter, and I love your blog so much. Everything you post is very informative.